The 1999 movie that made men salivate over rose petals, American Beauty debuted on high-definition Blu-ray on Sept. 21, 2010. 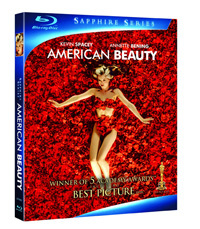 Paramount Home Entertainment released the five-time Academy Award winner as part of its Bu-ray Sapphire Series and priced at $29.99. The drama, starring Kevin Spacey (Seven) as a man going through a middle-age crisis, won Oscars for Best Picture, Best Director (Sam Mendes, Road to Perdition), Best Actor (Spacey), Best Cinematography and Best Screenplay. American Beauty also stars Mena Suvari (Factory Girl) as Spacey’s young object of lust, Annette Bening (Mother and Child) as Spacey’s controlling wife, Thora Birch (Ghost World) as their teenage daughter and Wes Bentley (Jonah Hex) as the strange neighbor who’s in love with Spacey’s son. All the extras were also included on the special edition DVD released in 2000.